Welcome to the web site of Mystique Pole Dance. We are a school in Zurich and just recently as well in Baar (near Zug). It's a school of pole dance afficionados for women and girls, who are eager to learn to master their body. Beginners, who start to get to know the moves, upto experienced pole dancers. All will be able to get something back from this school. New Studio in Baar ... first classes starting now! Now it's been a while already, since we opened our second studio in Baar (near Zug). Not far from the station in a street, which is kind of a main road "Marktgasse" (Marktgasse 7). The first class started on Monday 01-Dec-2014. Since then many classes have started. In running classe it's possible to join if you have experience. Currently there are various beginner classes and one intermediate classes running. Interested pole students are welcome to join running classes and participate in a teaser. Also for this form of teaser we take CHF 10. When we saw this room for the first time, it was clear that this is the ideal room for a pole studio. We couldn't help saying YES to renting this! At the end we waited for the spacially manufactored poles with 4.67m height in order to reallly start . These arrived now are installed, so we can start with the classes now. We look forward to go this next step together with you! Pole Dance is primarily a sport with elements of acrobatics, flexibility and dance. It has nothing in common with erotics. The school was founded as a labor of love for pole dance and not based on a promising business proposition. I want to share my enthusiasm and want to make you love this sport as I do. The body needs to be ready. A controlled buildup is a must. With me you will learn fast, as I assist you individually. But only as fast as it makes sense. Pole Dance isn't simply "tricks". Just as important is a proper execution and as well the transitions. In my school everybody is welcome. I don't care about the background. If students and teachers from other schools come to this school, they are received with open arms. As much I have no problem, if my students visit another school as well. The most important thing is the love for pole dance. This unifies us and makes us a family. 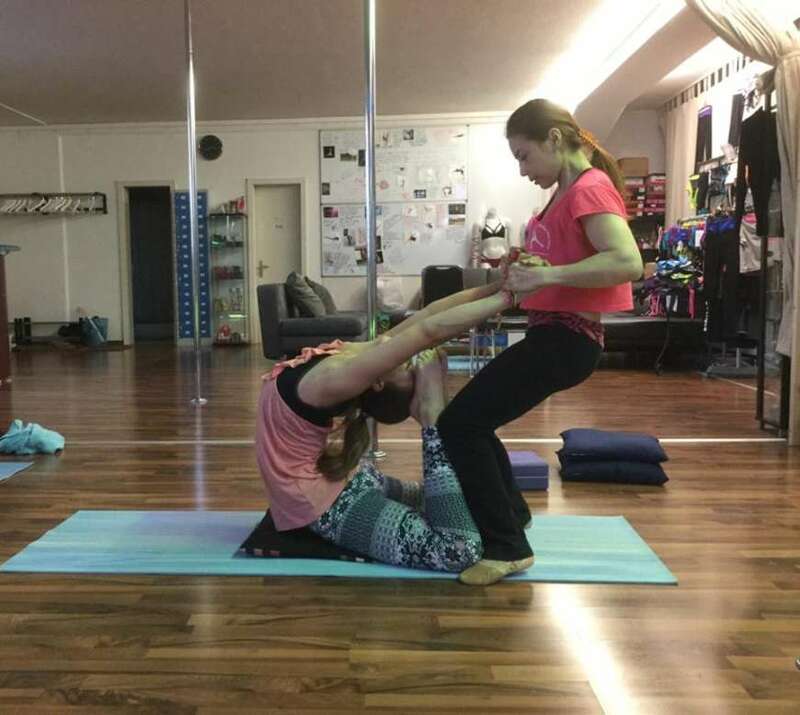 Pole Dance, Pole Fitness, Pole Acrobatics? What's now what? I understand myself as a pole dancer. Marketing foxes always are eager to find new expressions in order to differentiate themselves. So here they try to emphasize the fitness and acrobatics aspects. But today a pole dance requires a lot of fitness and a lot of acrobatics skills anyway, as much as many other skills. In the end we are talking about the same. It doesn't matter whether you dance the pole barefoot, sneakers or with high heels. This is after all a question of style and all of you can decide for yourselves. But one thing is certain. With me you learn everything that enables you to improve your pole skills, independently of the path you want to go.